Many people don't see the similarity between donuts and pizza - a hidden link known only to those who don't care for even dozens or thawing. Their delicious intricacies, in the hands of corporate tycoons, are lost on those who believe the world runs on dunkin' or that truly good food can come from a fast-food franchise. 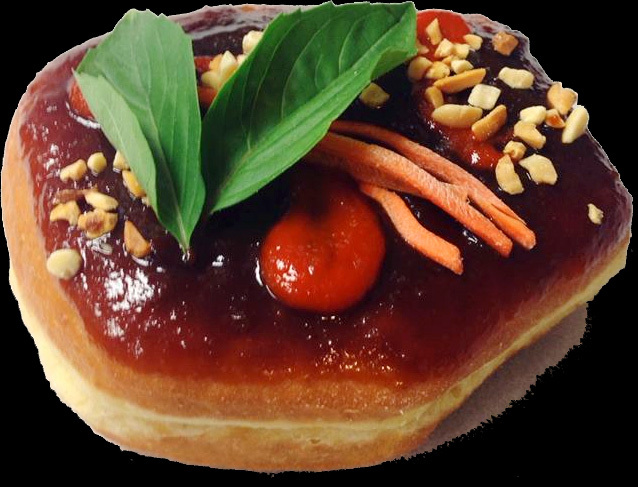 An amazing donut - like amazing pizza - is an art form. Neither can be mass produced to real satisfaction. A personal touch is often the magic ingredient, not present on the recipe card, that separates palatable from awesome. Few things are as awesome as a donut shop with it's own retro-style game app! We've been fans of Happy Badger Studio since Turkey Chase livened our Thanksgiving and Something Fragile taught us that survival may rely more on kindness than on an Uzi. Their games don't rely on any singular style - each seems to push into new territory - making it fun to see what they'll come up with next. Go download #strangevideogame: Strange Donuts Vs. The World! 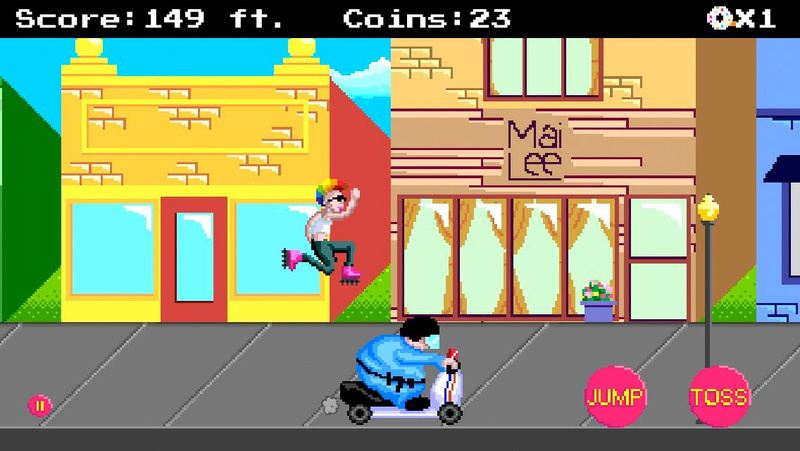 On the run and armed with donuts, you skate the streets of St. Louis jumping obstacles while throwing donuts at others. You'll encounter all sorts of oddities from UFOs to dinosaurs as you collect coins and Strange Donuts that give power-ups. The visuals and music are wonderfully reminiscent of NES-era games. It's a simple game to pick up and play, but has a well-set lure to keep you playing and striving to explore deeper in search of more strangeness! You'll not be disappointed. There must be a great story behind the collaboration between a donut shop and game developers that results in an 8-bit styled run-n-gun (since run-n-donut isn't a thing yet). It strikes me that Strange Donuts must be more than just a popular hangout with good food. The first review I saw on Yelp mentions their Bacon Donut - need I say more? Genius! Strange Donuts Vs. The World is available free for both Android and iOS. You'll find links to both versions on the Happy Badger website along with links to their other games. Check out what they have to offer, since they develop a wide variety of styles. You're sure to find something to your liking. Speaking of which, all the reviews I've seen recommend a visit to Strange Donuts.